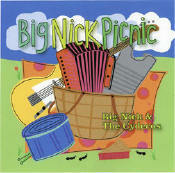 “Big Nick Picnic” is Big Nick’s third CD project. This album represents the results of much effort and growth for the band. Newly appearing on this recording are brothers John and Mike Sieger, who have been playing, performing, and writing music, quite successfully for many years. They bring a presence and power to the band that really picks up the spirit of the recording. And, John wrote the title cut: "Big Nick Picnic". For the past several years, Big Nick has been studying the Cajun accordion directly under the tutelage of such Cajun greats as Steve Riley and David Greeley, Dirk and Christine Powell (of Balfa Tourjours), Jimmy Breaux of Beausoleil, and Paul Daigle. You'll hear some new tunes & accordion techniques as a result! As usual, expect a kickin' gumbo of Cajun, R&B, and Zydeco numbers along with a few just-plain-fun songs! Need media player? Click here!